Snuggled in thriving greenery, this is an offering of one bedroom in a shared homestay, which can accommodate up to three people. Generous parking area within the premises makes parking convenient for those on a road trip, and the room on offer is ideal for an alpine vacation. Your Space This homestay is surrounded by lush valleys and features a charming old-fashioned façade. 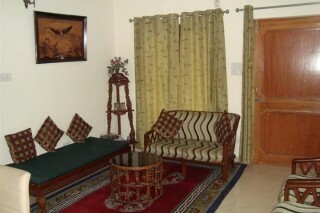 Inside, the homely abode has a living room with ample sofas so you and your companions can lounge here. The kitchen is equipped with a gas stove, a microwave, a refrigerator, and essential utensils, so you can enjoy delicious home-cooked meals all through your stay. 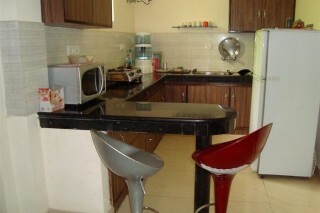 A lovely glass-topped dinette is provided to ensure comfortable mealtimes. 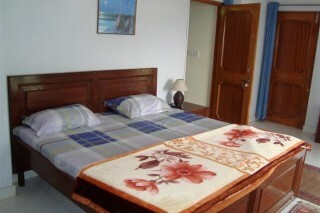 The spacious room on offer is furnished with a comfortable double bed, a generous wardrobe to store your belongings, a couple of cushioned chairs, and a television. The en suite washroom is tiled and fitted with western sanitary ware. Head over to the balcony to admire the misty valleys and feel refreshed. Guest Access Feel free to spend leisurely time in the common areas, and the swimming pool when you are not inside your apartment. Guest Interaction Feel free to reach out to the host in case you need any assistance all through the day. Local help is provided on request. Neighbourhood Overview The property is located in a very scenic area. 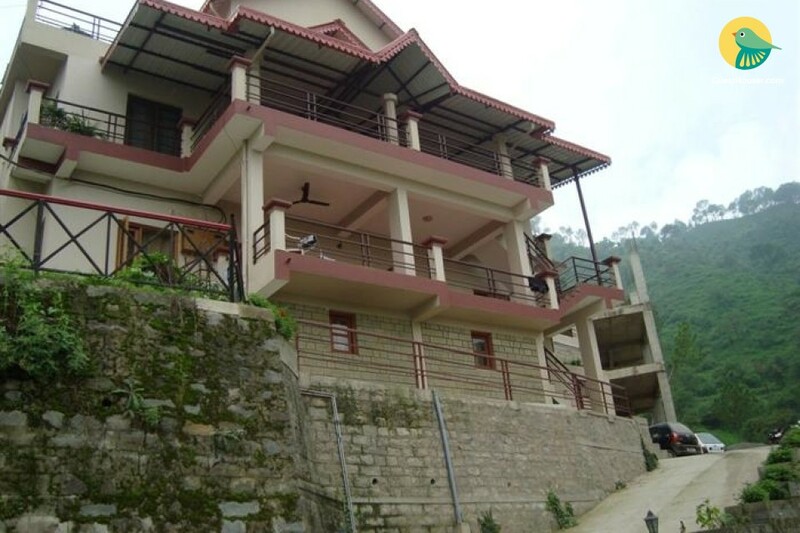 It is situated on Jagjit Nagar Road, and is 8 km away from Kasauli. Christ Church is 900 m away, Manki Point is 2.8 km away, Sunset Point is 1.3 km away, and Mall Road is just 1 km away. Getting Around Chandigarh Airport is 56.6 km away, and Chandigarh Railway Station is 46.7 km away. We do not provide a pick up and drop facility. We will not be able to arrange a cab. Any inconvenience this may cause is deeply regretted. Cabs can be hired from Chandigarh to Kasauli, and may cost around INR 1500. Additional Information Guests are requested to provide valid ID proof at the time of check-in. The services of a cook and two staff members are available for your convenience. Home-cooked meals can be provided on a chargeable basis. 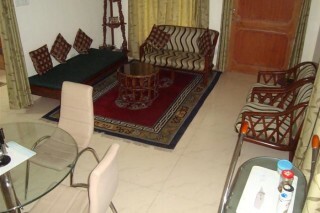 Breakfast, lunch, and dinner are provided on chargeable basis. Guests are prohibited from playing loud music in the property. One trained cook, a waiter and a housekeeper are on the rolls who are always available on beck and call. 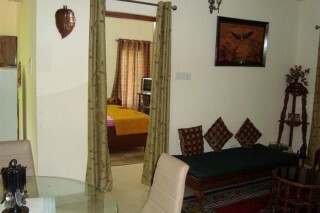 There are five well furnished bedrooms with attached dressing and bathrooms, drawing/dining rooms and modular kitchens. Travel assistance will be arranged. The stay was amazing! We like the property, location and the food too! It was delicious and as good as home cooked food. Location was pretty and convenient to reach. home stay is nice . and i want to go again some time in futur. and have a great exprience. i love it . but map location is not correct as specified. wat an amazing view. nice placce! The closest rail station is at Kalka, which is about 35 km away from Kasauli. Pre paid taxis costs about Rs 750/- approx. from Kalka to Kasauli. 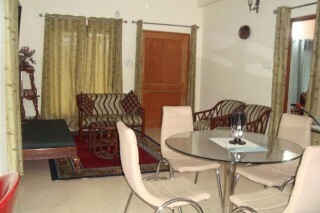 Kalka is very well connected with all major cities in India like Amritsar, Delhi, Kolkata and Mumbai. It is exactly 65 kms from Chandigarh airport and it takes about one and half hour to reach our location. Kasauli has a good network of roads connecting it with the rest of India. Situated at a distance of around 325 km from New Delhi, the hill resort can be easily reached by hiring a bus or a taxi, from the inter-state bus terminals (ISBT). You can easily get buses, coaches & taxis for reaching here from Chandigarh, Shimla and Kalka also.